Big Game Hunting Share your experiences, tips, techniques, and thoughts about big game hunting here. Deer, Elk, Moose, Bear, Bigfoot, or whatever else we may have missed. My son, his wife and my self all got sandhill crane tags. The unit closest to us and the one we put in for is like 500 miles round trip and they give out 10 tags a year. We did the 3hour drive , the mile walk . AND watched about 50 crane take off in small groups of 2 and 3 and fly across the river straight away from us. By 8:30 there was not a crane to be seen. We did some spot and stock hunts but in short stubble and cut alfalfa there was little hope. We did get permission to hunt the other side of the river next time out but it's about a 2 mile walk in ,in the dark. 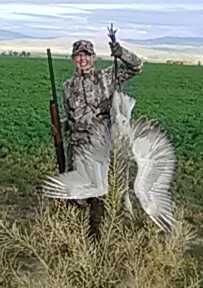 We'll get them in a few week plus there should be more birds down." Ever take "Murphy" on a hunting trip how about two? My boy his wife and myself all got sand hill crane tags, the unit we put in for give out 10 a year. It's near 500 miles round trip, this was trip number two. "Murphy" was with us both times. But the D-I-L was able to shake him off for a few minutes.